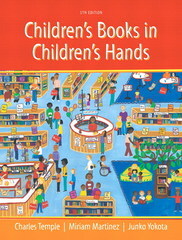 Children's Books in Children's Hands 5 Edition 'Children's Books in Children's Hands' is designed to give pre- and in-service teachers a wealth of richly illustrated, practical ideas for sharing literature with children. In it, renowned authors Charles Temple, Miriam Martinez, and Junko Yokota introduce readers to dozens of new books and the riches they contain; to their qualities; and to the many writers, illustrators, editors, and critics involved with those books. Coverage of the many genres of children's books includes picture books; literature of diverse perspectives; international literature; poetry; traditional literature; modern fantasy and science fiction, contemporary realistic fiction; historical fiction; informational books; and more.